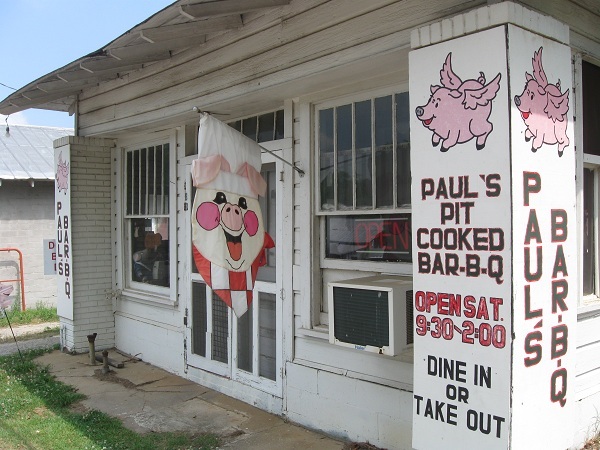 Paul’s Bar-B-Q, Lexington GA (CLOSED) – Marie, Let's Eat! At some point in the mid-90s, I started taking an interest in what I know today is classified as “roadfood,” and decided to cast my net wide and learn about some fascinating restaurants in the small towns that surround Athens in and around northeast Georgia. I sat down with the Flagpole Guide to Athens and, for the first time in my six years in town, read the darn thing cover to cover. The restaurant listings just amazed me. There were dozens more places to eat than I ever knew about. Most intriguing, in the barbecue section, was Paul’s Bar-B-Q in Lexington, which, the listing promised, was only open on Saturdays and on the Fourth of July. Something about that statement really appealed to me. Only two questions remained. Where the hell was Lexington and how fast was Saturday going to get here. This must have been 1995. For the next five years, I was down here once a month or not more than six weeks. Lexington is about twenty miles southeast of Athens down US 78. I used to pick up a couple of my comic books at a really small store at the intersection of 78 and Gaines School, and so I’d stop by there after lunch on the way home and maybe pick up a movie at the Video Library next door. Neither shop is there anymore; that whole strip mall looks a lot like a graveyard these days. When my daughter was born in 1998, she had to spend more than a week at St. Mary’s because she was so jaundiced and cranky. That first Saturday, my parents came up to meet her, and we went down to Paul’s for lunch. There’s not a lot in Lexington these days; Oglethorpe County really seems to be suffering the current recession, but Shaking Rock Park is always worth a visit. One of my favorite photos was taken that day: my dad climbed up on one of the rocks with me and with my son, then 18 months old. Dad’s been taking a beating from cancer and certainly couldn’t get up that rock anymore. My son is old enough to no longer need any help getting to places that high. I absolutely adore Paul’s, and for years insisted it was the best ‘cue in the state. However, my parents, who prefer Alabama / Memphis-styled barbecue, were really not completely thrilled with Paul’s, who serve up North Carolina-style. They use a vinegar sauce and while they claim they offer stew, it is really No’ca’lina hash. It’s thick enough that you can eat it by sopping it up with white bread. If there’s any finer, I have not found it yet. Paul’s is the only place where I insist my fellow diners use the hot sauce. It’s not a recommendation; their mild sauce is merely okay, and so I insist that the hot sauce is used. The hot sauce is absolutely essential to the experience. It used to be that Paul’s offered the third best pitcher of sweet tea in the state. With both Carrither’s and the Mean Bean now gone, Paul’s now stands alone as the best tea that anybody brews. I’ve had the same plate of pork, hash and slaw every visit for fifteen years now and never had a disappointment. It’s just a perfect lunch, made with love and class. The only reason I’ve ceded Paul’s title as the finest in the state is because some years later, I found a place in Buford which I’ll tell you about some other day, sometime in the summer maybe. The afternoon that I concluded that I liked it even better than I did Paul’s, I genuinely wept a little. But you know, I kind of like the experience of Paul’s a little better, even if one place outdoes them just a touch with their meat. I wish there was a little more to Lexington than a bunch of closed-up antique stores, but the countryside is so full of gorgeous old buildings and churches, and this time of year everything is just lovely to see. I’ve taken better than a dozen people out this way for lunch over the years, and as this family-owned business enters its ninth decade selling lunch to tailgaters, hunters, picnickers and foodies, I’ve no doubt I’ll be bringing many more. They’re only open on Saturdays and, often but not always, on the Fourth of July. That only gives you 53 chances a year for a lunch this downright great. Posted on May 17, 2010 July 29, 2017 by Grant G.Posted in athens, barbecue, georgiaTagged athens, barbecue, barbecue - our favorites, georgia, oglethorpe county, southern belly. Might be worth a trip to check out next time I am in Woodville. Looks to be a 15 minute drive up 77 to get there. I found your blog Googling about the restaurant closing. I loved this place so much and will miss it. You and me both. Thanks for writing. 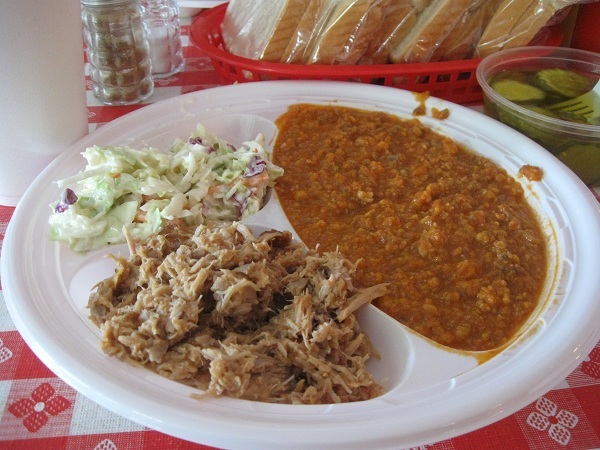 Pingback: Smoakies Bar-B-Que, Cordele GA – Marie, Let's Eat!